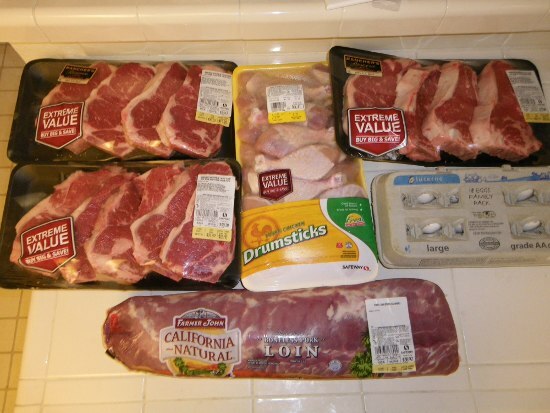 I have a thing about paying for meat – I rarely pay more than $2.00/lb. If you shop around you can usually find a deal around that price on steak, chicken, and pork. Back to 2001, I’d often splurge on more premium cuts of meats – Porterhouse and T-Bone steaks when they came in under $4.00. That was before I got laid-off in the dot-com bust. Since then I’ve tried to become more frugal and focus on cheaper cuts of meat. The rising cost of beef has made that $4.00 number for premium cuts a pipe dream… at least here in San Francisco… until now. I bought a little more than 11.5 pounds of the New York Strip Steak. A 16oz bone-in cut New York Strip Steak will probably cost $20-$25 in a restaurant. For those mathematically challenged 16oz is a pound – exactly what I bought for $3.97. The 11.5 pounds of steak is about $230 worth of restaurant dinners which cost me $46. I saved $184! The pork loin is probably not restaurant quality (it’s not center cut), so I won’t try to figure out the savings there. I will say that it was 7.8 pounds that usually costs $4.99 a pound, but was on sale for $1.67. That $13 buys a lot of meals. The drumsticks weren’t a big savings costing me $5.72 instead of $7.61, but it got the best reaction from my wife, so there’s some extra value in that. Lastly the 18 eggs were only $1.49 instead of the usual $4 price… I pocketed another $2.50 in savings there. What does it look like all packaged? Along the top you’ll see that I put the steaks two to a bag. In practice, one steak will probably feed the two of us. My wife doesn’t really enjoy a 16oz steak (even if some is bone) and I need to eat more veggies anyway. Each bag of steak is two meals for the two of us or 12 total. 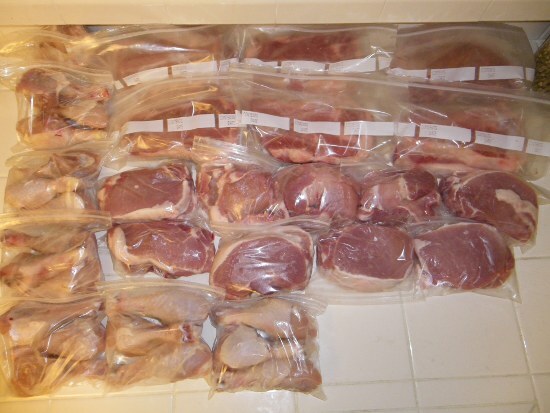 The 9 bags of pork loin below it each have two inch-thick cuts of pork making each bag a meal. Flanking the beef are 7 bags of drumsticks – 3 drumsticks to a bag. It will take two bags to be a meal for the both of us, so that’s another 3 meals (and a snack or appetizer some time). All totaled up the meat will make 24 meals for the two of us. The eggs will give us some breakfast meals. Please report back when you actually eat one of the steaks and let us know if it is as good as a restaurant steak. I don’t believe “ranchers reserve” is anywhere close to usda prime (it’s basically the “we don’t tell you what grade it is”). Costco has boneless usda prime strips for $10/lb which is more along the lines of restaurant quality steaks. I would have also included some more freezer bags in your purchase since your chicken appears to be in non-freezer bags. I did save one for my belly that night. Unfortunately, I grossly over-cooked it, so it’s hard to report back. I will say that I liked it even overcooked and my wife, who had already eaten liked the piece I gave her. For my pallet I think it’s going to be very good. The comfort of eating at home, with cheaper wine, and fireplace in the winter or outside in patio furniture in the summer add a lot too. Though I see what you mean about it possibly not matching restaurant steak. From my research on Rancher’s Reserve it seems like it’s trying to build a brand like Angus. It is a step up from Safeway’s basic brand. It’s funny that you brought up Costco. I mentioned to my wife that night when I was telling her about how my $2/lb. rule goes back to before I met her. I made a point that my friend picks up phenomenal steaks at Costco for the $8.99 price. Another friend of mine is tempted to get the $17.99 aged steak at the butcher, but can’t pull the trigger. The chicken and pork are not in freezer bags in the picture. I grouped them and put them in gallon freezer bags. I think I needed about 4. I have a pile of left over freezer bags from a previous sale – 4 freezer bags are pretty negligible. “Angus” is actually a breed of cattle. We had a few red angus on the farm when I was growing up (along with lots of Holsteins). Stubborn. Wow, you’ve got some tough critics here. A meal at home isn’t the same as a restaurant, but isn’t that the point? You can save quite a bit of money eating at home and you don’t have to pay the “list” price at a grocery store..
i don’t eat a lot of meat but like you i never pay more than $2 or so per pound. I often find pork shoulder or pork loin for .99 a lb and recently made my first delicious pulled pork. Chicken of course is always cheap. I rarely buy other red meat though when i want some chili i’ll use ground turkey. Do you have a deep freezer or a second refrigerator? I don’t know if I could fit all that into our fridge. I like the organization though! Just a little confused. You said 2 bags of drumsticks are a meal for 2. That’s 6 drumsticks or 3 each, isn’t that a lot of protein?? I know where i get my chicken drumsticks they are huge and we usually have 1 per person with meals. And from the picture they look like a far size. Maybe having less will help your body and save you money. Safeway has surprising bargains on meats, esp. considering that most people regard it as an expensive place to shop. While it is true that Costco’s meat is better, some of the products at Safeway are perfectly fine. I’ve found Rancher’s Reserve steaks are OK…better than Albertson’s beef, by a long shot. Here’s another trick: Safeway’s butchers will grind roasts into hamburger for you. This produces a superior quality of hamburger that’s much better than the prepackaged burger. Couple of days ago, I nailed a chuck roast for 99 cents a pound (!!! ), over a dollar/pound less than the store was charging for hamburger. If you get a bone-in roast for this purpose, ask them to give you the bones. Drop them in a bag & collect them the freezer, and when you have a couple pounds of them, turn them into a wonderful soup stock by simmering them in water with a chopped-up onion, a stick of celery, a couple of carrots, and a dollop of red wine. Deeelicious! I don’t think these drumsticks are that big. Three of them when you subtract bones, are probably around 8 ounces. It’s probably more than recommended by dieticians, but far less than you’d get in a restaurant. I’m also being conservative because I don’t want to over-estimate the value of this deal. I almost expected an insurance shill – your title sounds like a Geico ad! I too try to keep meet under $2.00/lb – although it’s difficult to do with any type of steak. Not too hard on boneless skinless chicken, ground beef, and port, but at <$2, my wife tends to not like the beef. I've never really shopped at Safeway, but Kroger (when on sale) is usually ok on meat - but I never buy meat at Walmart - it's always overpriced.